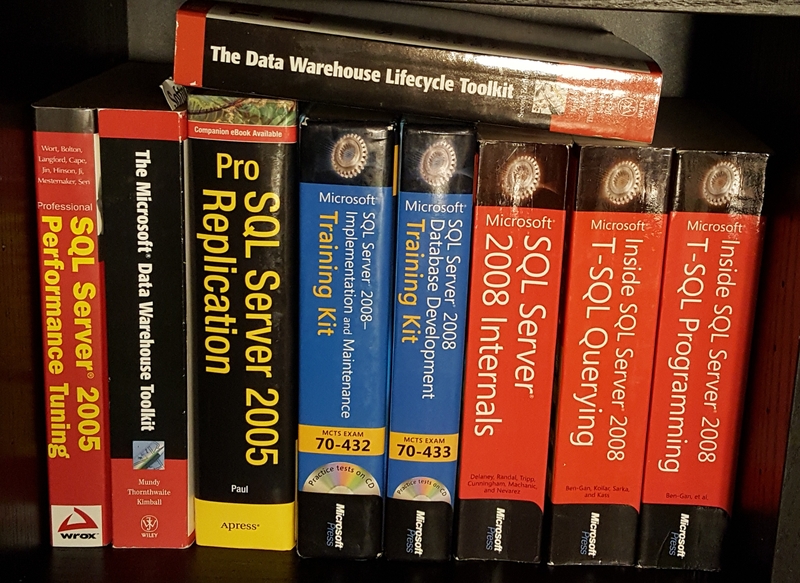 This is a post for T-SQL Tuesday #96 and it is about “…the opportunity to give a shout-out to people (well-known or otherwise) who have made a meaningful contribution to your life in the world of data.” It is being hosted by Ewald Cress aka @sqlOnIce Thanks Ewald! So just so you know, my antilibrary is vast. I wish I had the money and time to buy books and to read them all while knowing that I am only scratching the surface of what I am able to learn about. Softpro Books was a one of a kind of a brick and mortar store. It ONLY carried tech books. But only the latest versions. If you wanted something that was 2 or 3 years old, chances were they no longer carried it. They could probably order for it you if you really needed it. I bought so many books from that store that I literally have hundreds of bookmarks from them. I used to joke with the store’s owner, Jim Treitman, that I should probably go ahead and deposit some of my payroll check into the store every month. 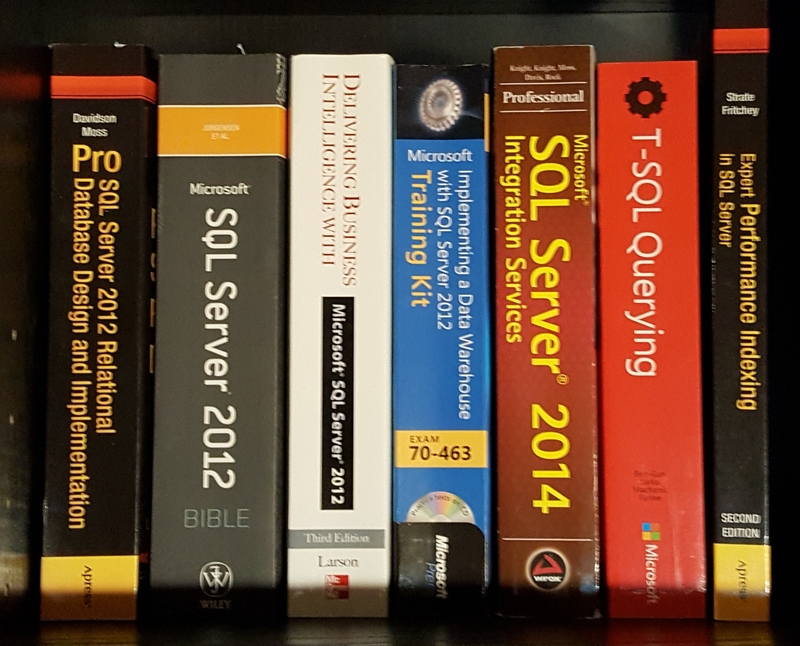 I would daily check their RSS feed for new releases, especially as it related to SQL Server. Had this conversation hundreds (!) of times over the years. From a personal touch to a knowledgable staff they were awesome. The smell of coffee, National Public Radio playing in the background and a store full of candy. To me it was a slice of Heaven. And at times when several people were in the store we would share ideas or help solve each others technical problems. But alas, they couldn’t hold out against two major forces: Amazon.com and the decline of technical books. They knew the writing was on the wall about loosing out to Amazon but so did a lot of other small bookstores. The fact that they lasted until May 2014 was incredible to me. The second part was a bit more troubling. In an age of technology why did it seem like less tech books were getting published than before? There just isn’t much money to be made being a tech author plus it is an insane amout of work. I doubt ANY tech author will ever make it on to either Amazon’s or the New York Times bestseller list. Blogs and on-line documentation are the main written sources now. Things change too fast today- by the time the book is published parts of it will already be out of date. Plus something else happens- it becomes a drag on the author. Some authors just want to write a book and be done with it. They don’t want to be held hostage to it to keep it up-to-date as versions change. Or keeping the code compatible with different versions of the software. Or responding to technical errors or adding errata that got missed or overlooked. One of our local computer retailers, Micro Center, has nearly stopped carrying books altogether. 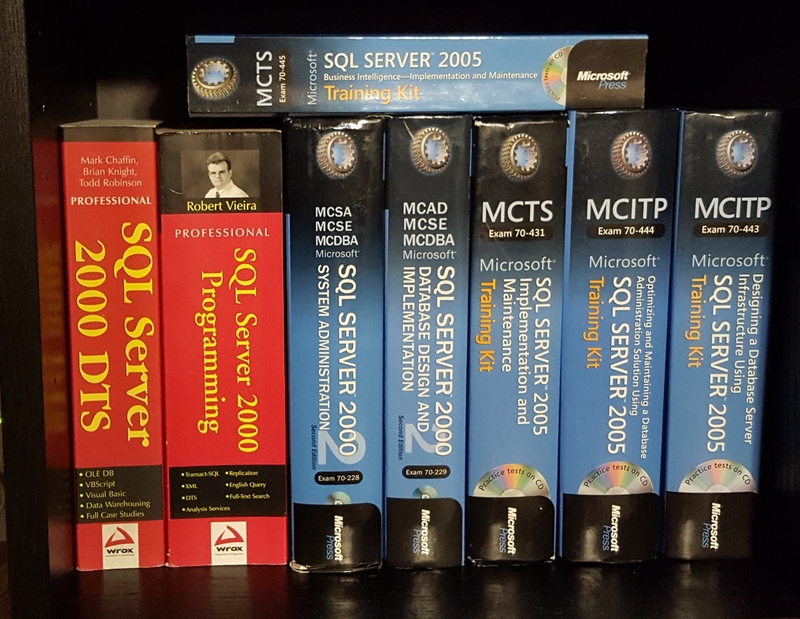 They too used to have rows and rows of computer books. But not anymore. Plus have you seen the Teenage Vampire Romance section in Barnes and Noble lately??? 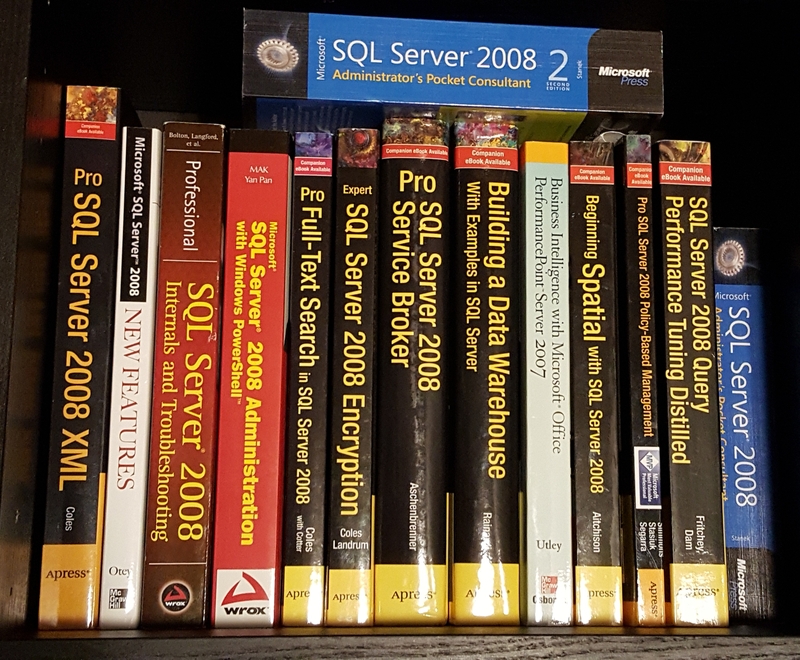 It is bigger than the data books section. Bookstores will only carry what sells. Jim started his own Battery Giant franchise store in Denver, Colorado in June 2014 after closing his Softpro Books store. The battery for my indoor garage opener recently died and so I had a chance to give him some business and catch up. Great guy. And now a reveal. 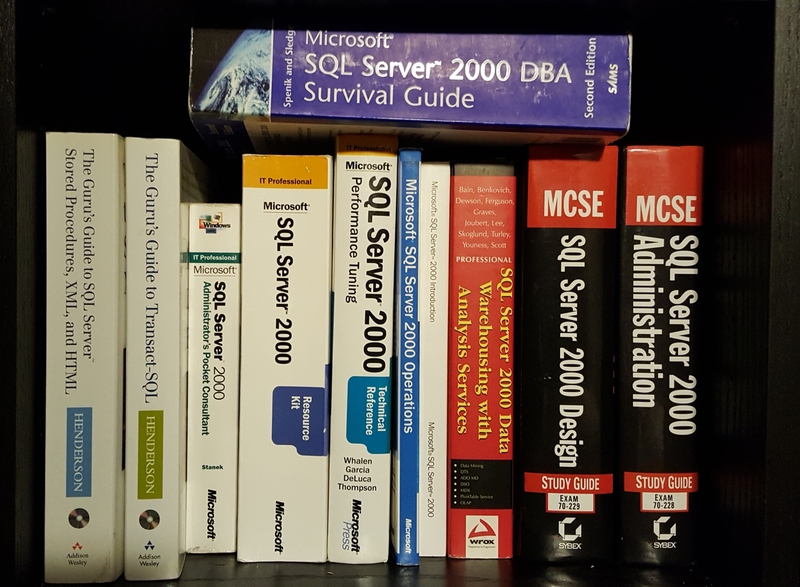 I started working with SQL Server 7.0 back in 1998 and became an accidental database administrator (DBA) full-time in 1999. I was a scared to death introvert and books became my friends. So I began hoarding books. Just kidding. Well, maybe. 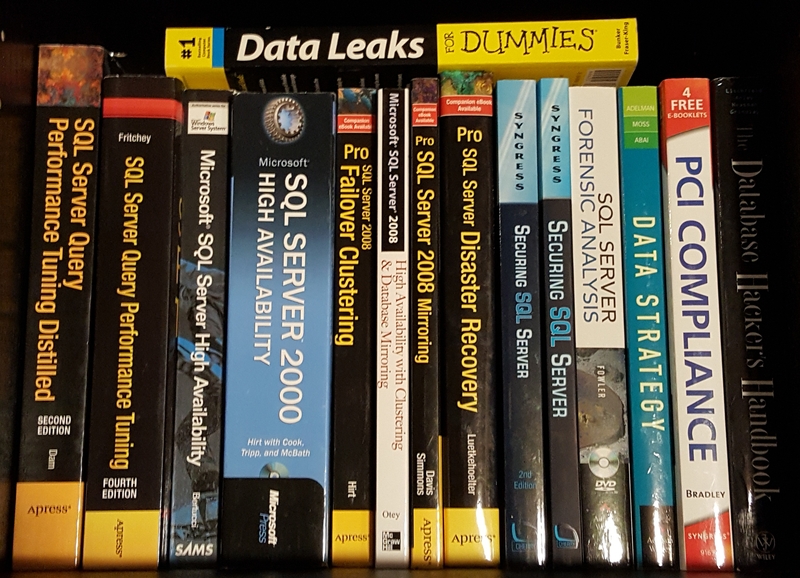 I did begin however buying and reading A LOT of SQL books. Slinging code, working through the examples. 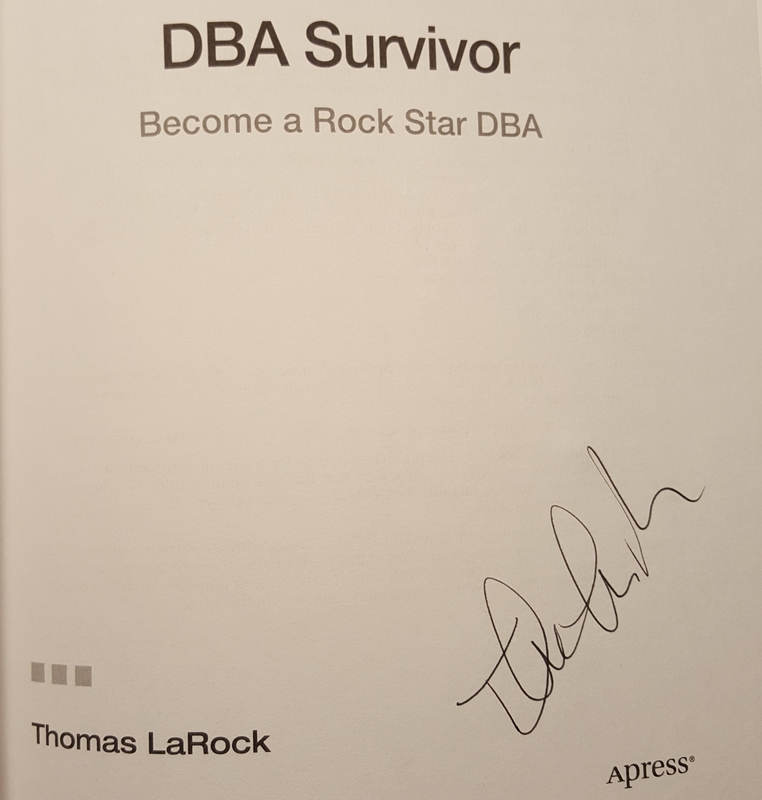 I became a self-taught DBA. 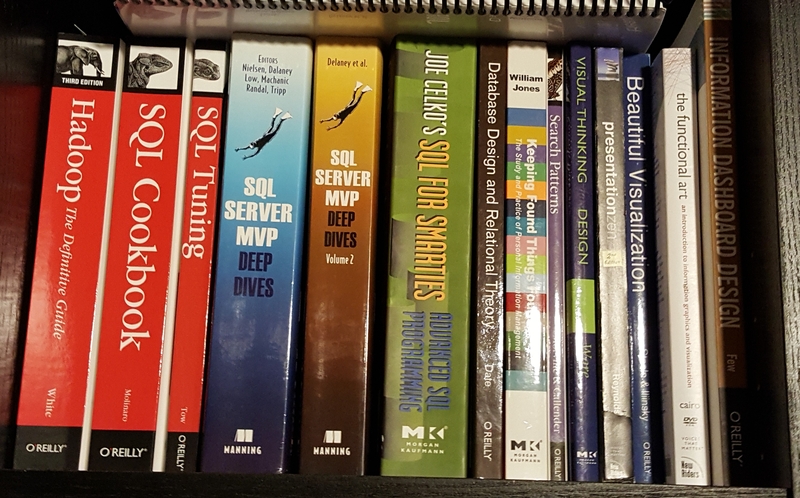 Yes, I DO have many other books too and might share them at another time but these are just the SQL ones I wanted to highlight for this post. I began to even feel at times that I was having a conversation with the author(s) as I read their work. Some had a super dry tone, others sounded like they were in the room with me. Over the years when an author whose book I had was going to be in town, I made an effort to bring my copy for them to sign. 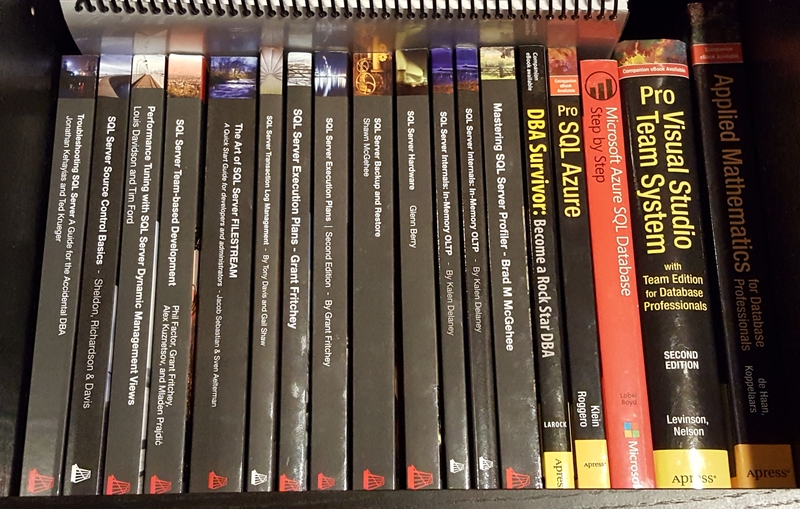 User groups, SQL Saturday events and the PASS summit. This is for a personal collection. 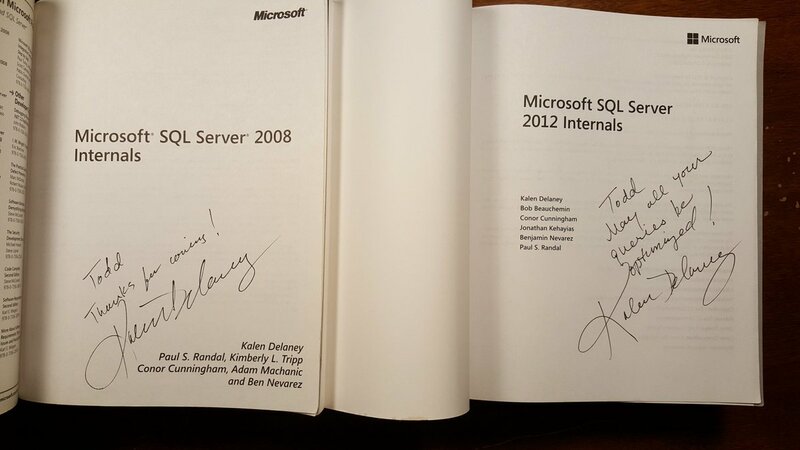 I doubt any of these will every bring top dollar on eBay for being signed by the author(s). The MVP book signing was great as I had a chance to get several authors to sign it. More on that story in a moment. And I have some titles on my shelf at my office as opposed to my basement as well. 1. I am working on a current project and need to absorb the information quickly. 2. I want to do a deep dive on a subject and want to understand it thoroughly top to bottom. 3. I want to have a general understanding about something so I will skim the pages and maybe read it cover to cover. One thing I personally cannot stand is getting blind-sided by something obvious that I could have read about in a book. Yes, that is an introvert fear of mine. 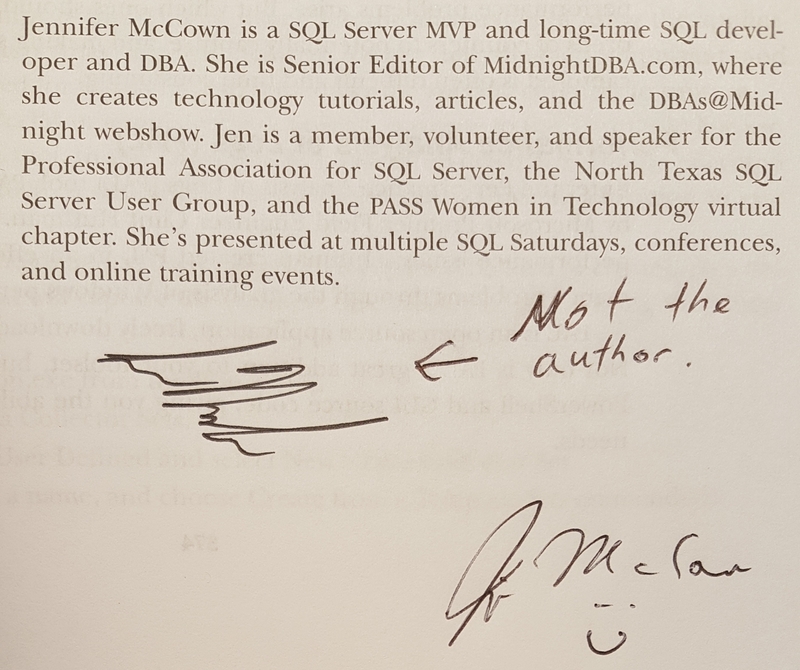 At the 2011 PASS summit, @JenniferMcCown was a new author. 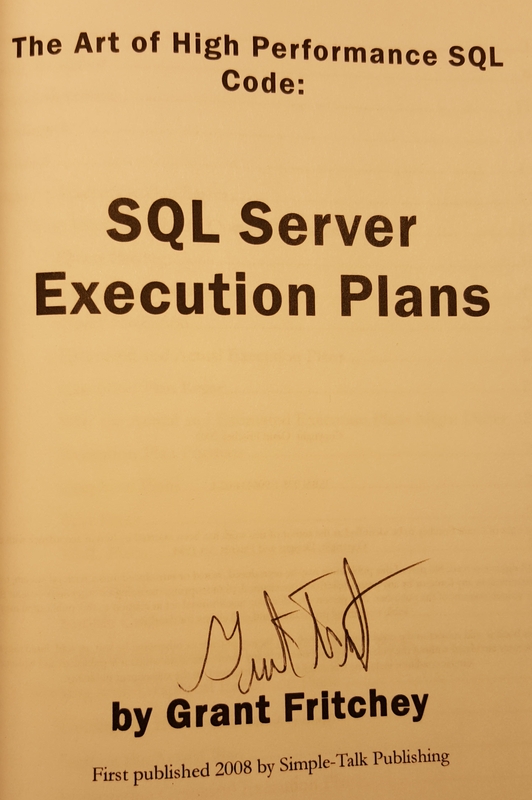 I was in line to get her signature in addition to several of the other MVP authors too for the recent book SQL Server Deep Dives Volume 2. I had bumped into her and her husband Sean earlier in the day. Sean just happened to be walking by, saw me in line and said, hey, let’s play a trick on Jen. Let me sign something on her page of the book. Which he did and is the last image above. And so when I got up to Jen, she opens the book to her page, and you should have seen the look on her face. 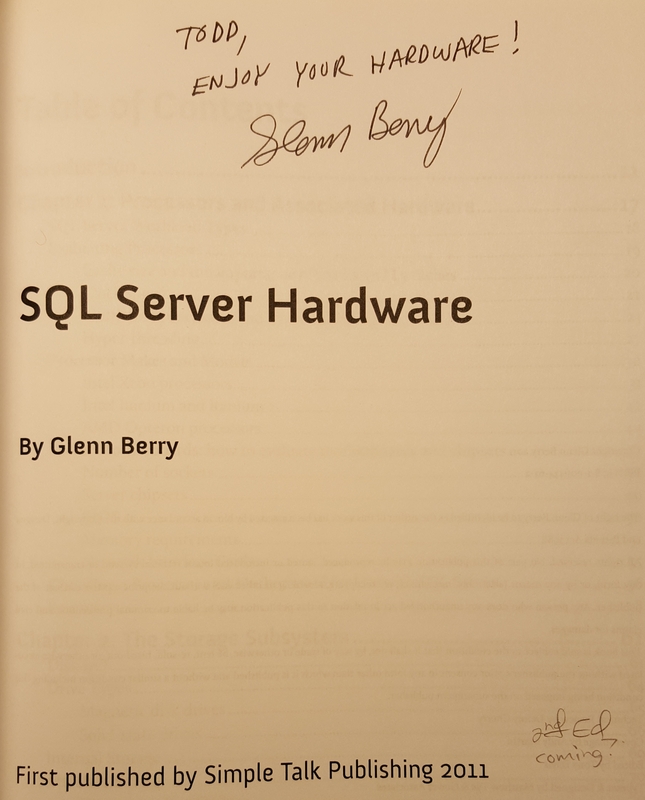 Someone else had already signed it! Sean and I and others had a good laugh. Please understand I have never published a book. So some of the following advice are just my thoughts. 1. Ask to be a technical reviewer- or as a second set of eyeballs. READ everything and work ALL of the code examples. Test for various versions of both the database engine and SQL Server Management Studio. Provide feedback and suggestions. 2. Ask to refresh an older version of the book. 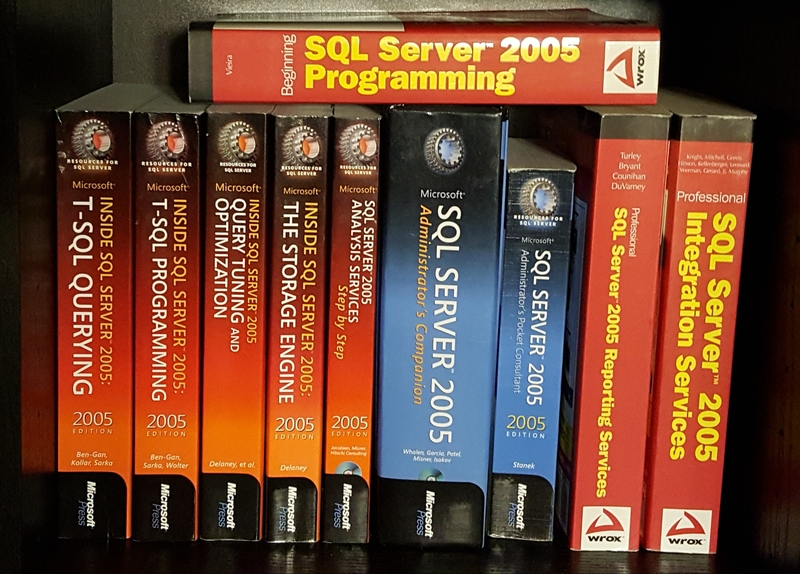 Several titles that I have are now out of date and have not been refreshed either in print or electronically. 3. Create a new book. 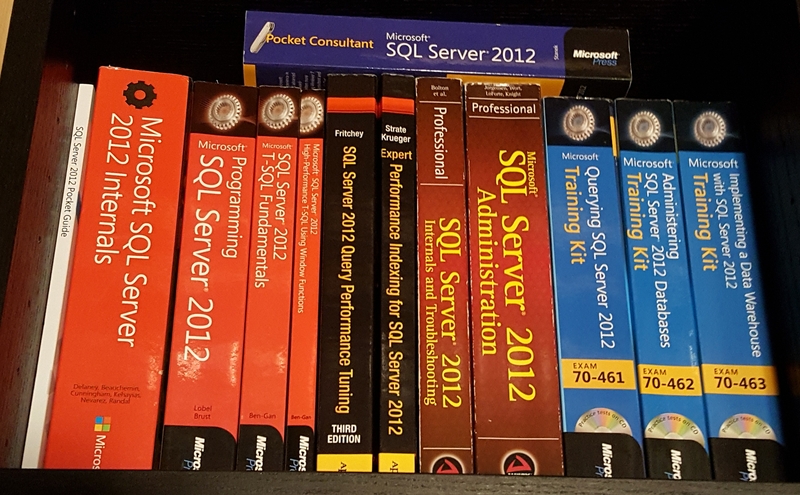 If I had to chose right now, I would pick either SQL Server Migrations and Upgrades or Multi-Terabyte SQL Server Administration. These authors which I have read over the years are my heroes. THEY inspire me to apply what they have learned and shared in print form. Without them, I doubt I would be where I am today. Like I said before, they are NOT in it for the money. They have their reasons why they publish and I am forever grateful for those who put in the hard work to become an author. The Diamond Age has a concept in it known as a ractor. This ractor is a human actor but their voice and movements have been altered into an avatar which interacts with a young girl. The ractor grows up with the girl as she becomes an adult. What is interesting is that the ractor(s) use technology that is encrypted and the ractor is both anonymous and yet trusted. But this is a sci-fi book, one I highly recommend reading. Based on some informal conversations, I discovered the following. The number of members of the site SQLServerCentral is about two million. The number of people registered as PASS members is about 250,000. The number of people who can physically and financially attend the PASS summit is ~5,000. So for people to stay connected, learn and share compared to Summit is tiny. Yes, there are user groups, SQL Saturday events, PASS virtual chapters, etc. but there is no personal interaction available for people, especially if they are financially or physically unable to attend. Twitter and Slack channels notwithstanding, those are still written communication and not social vehicles that I am about to describe. I am one to make some bold predictions. What is going to happen when authors can meet their readers in virtual reality? What is going to happen when authors can share fantastic Quillustrations instead of whiteboard sessions in VR? Or how about using Bigscreen to collaborate with friends instead of a GoToMeeting? Heh, what is going to happen to the virtual chapters of PASS when they become VR chapters? 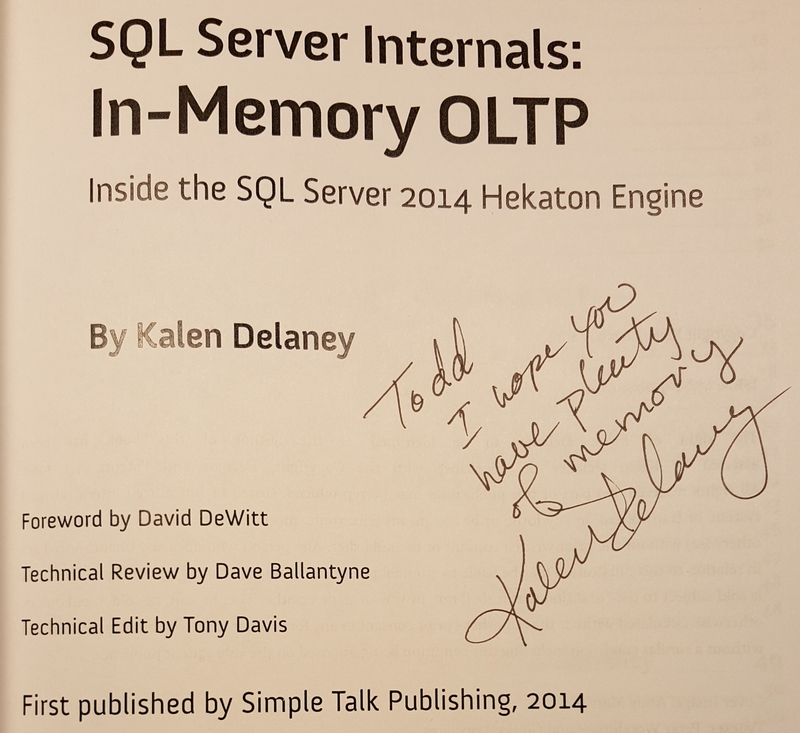 I can see the time coming where vetted SQL Server professionals can reach out and host either hands-on or presentation sessions to connect to people who normally might not be able to attend in-person events. Same for remote hands for troubleshooting. Personally I know of some folks who are on the neurodiversity spectrum. Think about autism for example. They can have a hard time trying to communicate with people let alone hold down a job. Imagine if the tech of VR and the selfless service of the SQL community can bring these people into the SQL family with patience and understanding. The last ~20 years I have been into books and seeking out the voices of authors. What will the next ~20 years look like with connecting to people and voices from places that I might not have ever heard from?